Yesterday my husband and I ended a 23-day dash around Europe. Today we begin a quieter four weeks in the Tuscan countryside, nine kilometers north of Siena, Italy. So where to begin? We committed to this sabbatical two years ago. Preparations for it were exhausting, expensive and often overwhelming. Dan and I both have demanding work lives and tasks that had to be taught and delegated to others. We have a home, a cat, bills that must still be paid and concerns about aging parents. Our plan was probably too ambitious. But here we are. Thanks to the generous and insightful planning of earlier partners at Dan’s law firm who recognized the value of regenerative time, we are on sabbatical: two months of time to travel, think, read, write, experience, enjoy and celebrate. I have been taking hundreds of pictures and furiously scribbling notes in the Italian leather travel journal my sons David and Andy gave to me for Mother’s Day this year. (“They know their mother well,” my husband said when it arrived in the mail.) Any time we had a few hours on a train, I’d pull out my laptop and pound the keyboard. I didn’t want to forget a thing–not one meal, not one scenic vista, not one exciting revelation. Now it is time to process: to absorb, reflect upon, appreciate and enjoy again the experiences of the past few weeks. And to gently step into the new adventures this beautiful Italian countryside has to offer. Before we went to bed last night, Dan and I were relaxing in an upstairs room the first of our guests (my cousin’s daughter Andrea, 23, and her friend Lauryn, 21) immediately dubbed “the wi-fi room.” Dan was catching up on some reading and I was emailing family members when a huge wasp flew in through one of the screen-less windows. It couldn’t figure out how to escape. It would buzz angrily, then pause for a bit of rest. It kept setting its sights too high–aiming for the ceiling instead of recalibrating its flight back toward any of several large open windows. So many obvious escapes. So little satisfaction from pounding relentlessly into a hard brick ceiling and ancient wood beams. There was nothing Dan or I could do. We didn’t want to risk getting stung by trying to ease the wasp toward an opening. Eventually we went to bed, closing our bedroom door against the sound of its frustration. This morning, as I tiptoed down the red-tiled stairway to the kitchen, I found the wasp, dead, on one of the steps. It had exhausted itself. I made some coffee and enjoyed my breakfast — hazelnut biscotti, a ripe banana, some sunflower and pumpkin seeds. 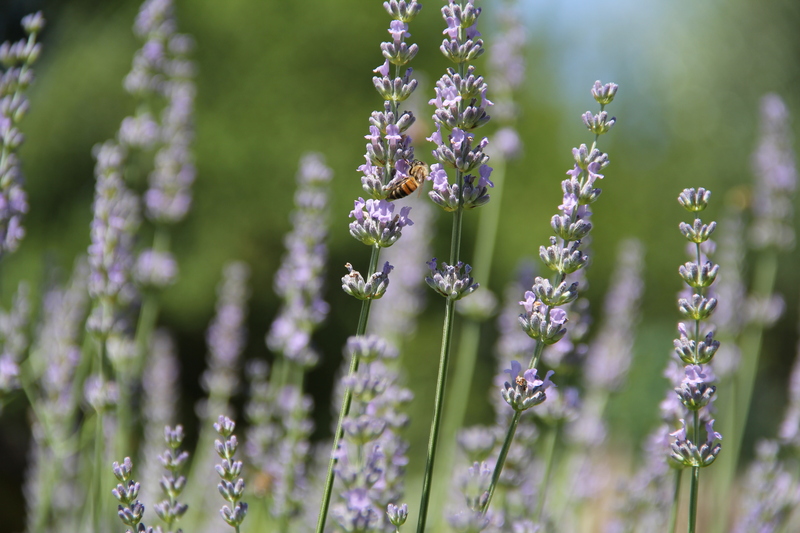 A gentle breeze and the whispers of tall, swaying pines just outside the kitchen door drew me to the patio, where I discovered a giant patch of lavender. Dozens of bees buzzed happily around it, doing work they know in a place they love. Just enough work.